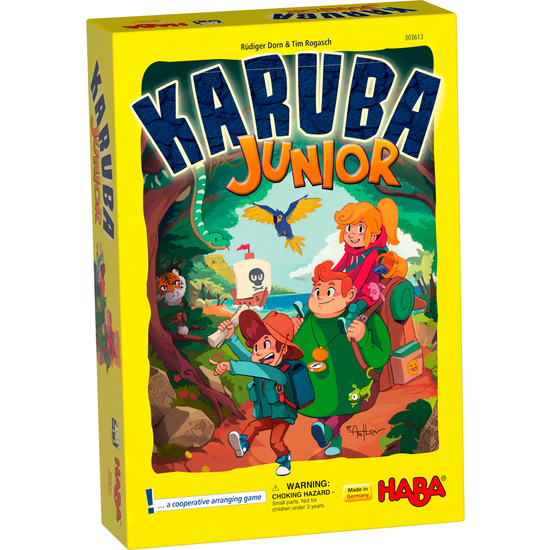 an exciting junior variant of the successful family game "Karuba"
Together the players head off on an exciting search for treasures in the jungle on the island of Karuba! Will they manage to arrange the tiles so that they reach all the treasures before the mean pirates raid the island? They'll need to work together, and be careful of tigers that block the paths. With skill and a bit of luck they'll be faster than the pirates! Contents: 28 tiles, 2 game board pieces, 3 adventurers, 1 pirate ship, 1 set of instructions. Short game instructions: • Piece together the game board. Place adventurer on the beach and pirate ship on the first ship space. • Place all tiles face down around the game board. • Play in a clockwise direction. Turn over tiles. Path: Continue to build the path. Tiger: Tiger blocks the path at this point. Treasure: Lay it down and move an adventurer to this treasure. (If there is an uninterrupted path from the beach to the treasure.). Pirate ship: Move pirate ship to the beach. • If no more tiles can be laid down/pirate ship reaches beach: Karuba Junior is lost together. • Three treasure tiles connected to the beach; Karuba Junior is won together.